The human foot is a highly developed, biomechanically complex structure that serves to bear the weight of the body as well as forces many times the weight of the human body during propulsion. Apart from these main bones, the sesamoid bones help improve function and are often found as variants of the accessory bones. The foot itself can be divided into 3 parts: the hindfoot, the midfoot, and the forefoot. The hindfoot is composed of 2 of the 7 tarsal bones, the talus, and the calcaneus; the midfoot contains the rest of the tarsal bones; and the forefoot contains the metatarsals and the phalanges. The images below depict the bones of the foot. Bones of the foot, dorsal and ventral views. Bones of the foot, medial and lateral views. The tarsal bones are 7 in number. They are named the calcaneus, talus, cuboid, navicular, and the medial, middle, and lateral cuneiforms. The calcaneus is the largest of the tarsal bones located in the heel of the foot and bears the weight of the body as the heel hits the ground. This bone protrudes out at the back, providing a strong lever for the triceps surae muscles of the calf and helping with plantar flexion and push off during ambulation (see the image below). The calcaneus is roughly 3-dimensionally rectangular in shape, with its long axis directed anteriorly and laterally, and it has 6 surfaces. The superior calcaneal surface (see the following images) of the calcaneus has 2 parts: articular and nonarticular. The nonarticular part extends posteriorly to form the heel; it varies in length in different individuals, is convex from side to side, is concave in the anteroposterior axis, and supports a fat pad situated anterior to the calcaneal (Achilles) tendon. The articular part that lies anterior to the nonarticular part of the superior surface has an oval facet; the posterior facet faces superiorly and is also tilted anteriorly. The articular portion of the superior surface is convex in the anteroposterior axis and articulates with the posterior calcaneal facet on the undersurface of the talus. Superior surface of the calcaneus bone. Anterior surface of the calcaneus bone. At the anterior boundary of the posterior facet is a deep depression, which continues posteromedially in the form of a groove. This groove is called the calcaneal sulcus. It matches the inferior similar sulcus underneath the talus, and both these grooves form a canal in the hindfoot called the sinus tarsi. Just anteromedial to the calcaneal sulcus is another area of articular surface elongated and concave in its long axis that is directed anterolaterally. 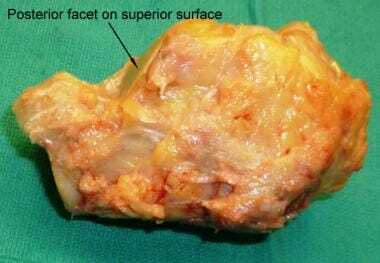 This articular surface is divided by a transversely oriented notch into a larger facet, called the middle facet, as well as a smaller facet anterior to this, called the anterior facet (see the previous image). 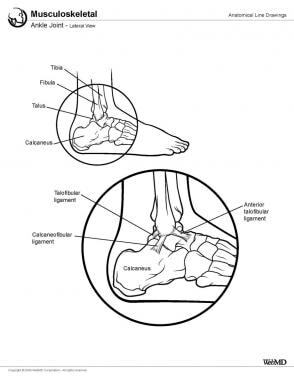 The middle facet lies on a medially projecting process of the calcaneus called the sustentaculum tali (see the image below). It articulates with the middle calcaneal facet on the under surface of the talus. The anterior facet lies on the anterior process of the calcaneus and articulates with the anterior calcaneal facet on the talus. The upper surface, anterior and lateral to the facets, is rough for the attachment of ligaments and for the origin of the extensor digitorum brevis. Medial surface of the calcaneus bone. The inferior or plantar calcaneal surface is wider posteriorly and convex from side to side. It has a plantar prominence at the back, called the calcaneal tuberosity (see the following image), which has a central longitudinal depression dividing it into a smaller lateral process that is the origin of a part of the abductor digiti minimi (quinti), as well as a larger broader medial process that gives attachment, by its prominent medial margin, to the abductor hallucis, and in front to the flexor digitorum brevis and the plantar aponeurosis. Lateral view of the calcaneus and cuboid bones. The depression between the processes gives rise to the abductor digiti minimi (quinti). The rough surface in front of the processes gives attachment to the long plantar ligament and to the lateral head of the quadratus plantae. The plantar calcaneocuboid ligament is attached to a prominent tubercle nearer the anterior part of this surface, as well as to a transverse groove in front of the tubercle. The lateral calcaneal surface (see the image below) is broader posteriorly and becomes narrower anteriorly. It has a small tubercle in the middle, to which the calcaneofibular ligament is attached. 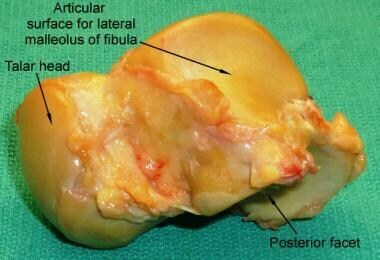 Anterior to this tubercle are 2 grooves separated by a ridge, the trochlear process or peroneal (fibular) tubercle. The fibularis (peroneus) brevis tendon lies superior and the fibularis (peroneus) longus tendon lies inferior to the peroneal (fibular) tubercle. Lateral surface of the calcaneus bone. The medial calcaneal surface (see the first image below) has a deep concavity in the anteroposterior direction in which run the neurovascular structures from the leg into the foot. Toward the upper and anterior end is a medially oriented horizontal projection, the sustentaculum tali (see the second image below). 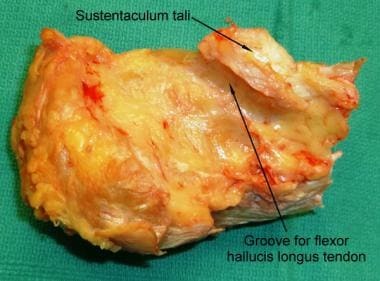 The sustentaculum tali has an articular surface for the middle calcaneal facet and is grooved inferiorly to house the flexor hallucis longus tendon. Its anterior margin gives attachment to the plantar calcaneonavicular ligament, and its medial margin gives attachment to a part of the deltoid ligament of the ankle joint. Medial view of the talus and calcaneal bones. The anterior calcaneal surface (see images below) provides articular surface to the calcaneocuboid joint and is roughly triangular. It is concave in an oblique inferolateral plane and convex in a plane perpendicular to this. Anterior view of the talus and calcaneus bones. The posterior calcaneal surface is convex, dome shaped, wider inferiorly, and has 3 distinct areas. The lower part is rough, covered by fibrofatty tissue of the plantar heel pad. The middle part gives insertion to the calcaneal (Achilles) tendon. The upper part is smooth, slopes anteriorly, and supports a bursa, which lies between it and the calcaneal (Achilles) tendon. 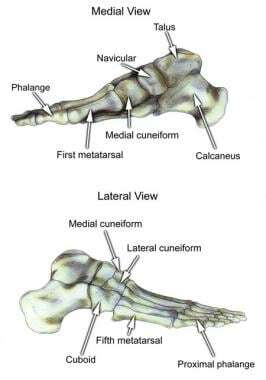 The calcaneus articulates with 2 bones: the talus and cuboid (see images below). Lateral view of talus and calcaneal bones. The talus is the second largest tarsal bone, and it is situated above the calcaneus in the hindfoot. This bone is unique in that two thirds of the talar surface is covered with articular cartilage, and neither tendons nor muscles insert or originate from this bone. The talus has 5 articular surfaces, all of which have a weight-bearing function. The talus is composed of 3 parts (the head, neck, body) and 2 processes (the lateral and posterior). The talar head is the portion that articulates mostly with the navicular. The body includes the dome of the talus at the ankle joint and the posterior facet at the subtalar joint. Between the head and the body is the neck, which does not articulate with the ankle and sits over the sinus tarsi below. The body and neck of the talus are not coaxial, because in the horizontal plane the neck angles medially with a variable angle of declination. 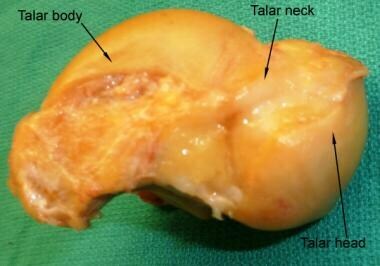 The talar head looks forward and medialward; its anterior articular or navicular surface is large, oval, and convex. The anteroinferior medial portion of the talar head is quadrilateral or oval and provides articulation with the anterior facet of the calcaneus. This portion of the head is flat and continuous anteriorly with the navicular articular surface (see the images below). Superior surface of the talus bone. The head of the talus nests within an articulation known as the acetabulum pedis, or foot socket (see image below), as described by Sarrafian. This socket is formed by the calcaneal middle and anterior surfaces connected to the large navicular articular surface by the inferior and superomedial calcaneonavicular ligaments. The acetabulum pedis has a variable volume capacity and adapts to the changing position of the talar head during gait. 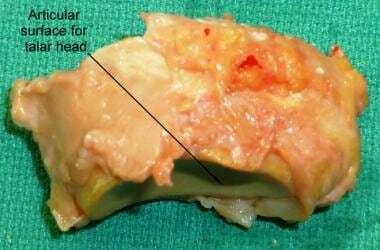 It is hinged laterally by the lateral calcaneonavicular component of the bifurcate ligament and medially by the posterior tibial tendon and the spring ligament. Superior view of the acetabulum pedis. The neck is directed forward and medialward 15-20º and comprises the constricted portion of the bone between the body and the oval head (see the following image). This portion of the talus is most vulnerable to fracture. The neck has 4 surfaces: (1) superior, (2) lateral, (3) medial, and (4) inferior. Medial surface of the talus bone. The superior surface of the neck is limited posteriorly by the anterior border of the trochlea of the talus (the dome or body) and anteriorly by the articular surface of the talar head. 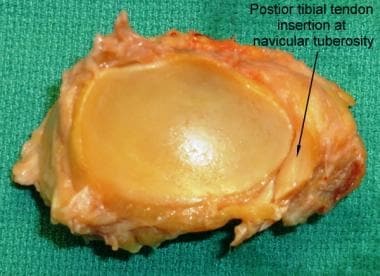 The tibiotalar capsule inserts along this superior surface just proximal to the insertion of the capsule of the talonavicular joint. The lateral surface of the neck is concave and is continuous below with the deep groove for the interosseous talocalcaneal ligament. It provides an insertion for the medial aspect of the inferior extensor retinaculum. The inferior surface of the neck forms the roof of the sinus tarsi and sinus canal. 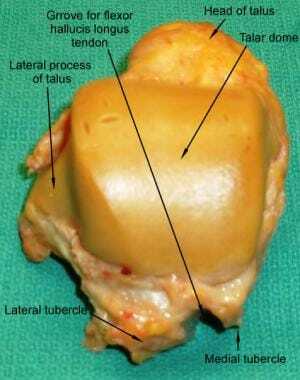 The medial surface provides an area for insertion of the talonavicular ligaments. The body of the talus is arbitrarily divided into 5 surfaces: (1) lateral, (2) medial, (3) superior, (4) inferior, and (5) posterior. The lateral talar body surface carries a large triangular facet, concave from above downward, for articulation with the lateral malleolus (see the image below). 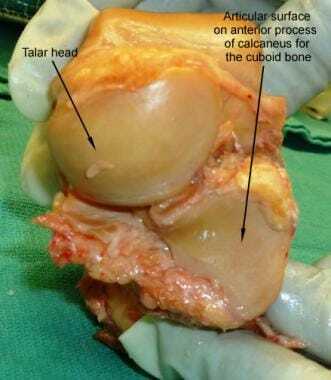 It is continuous above with the superior articular surface and in front of it is a rough depression for the attachment of the anterior talofibular ligament. Along the anterior, inferior, and posterior perimeter of this lateral articular surface is the lateral process, a nonarticular component of the talus. The lateral talocalcaneal ligament inserts at the inferior tip of the lateral process. Along the anterior border of the triangular lateral process are 2 tubercles for insertion of the anterior talofibular ligament. Along the posteroinferior border of this lateral surface lies a groove for the attachment of the posterior talofibular ligament. Lateral surface of the talus bone. The medial talar body surface of the body presents 2 areas, superior and inferior(see the following image). 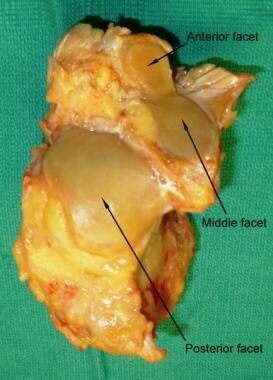 The superior portion is occupied by a pear-shaped or comma-shaped articular facet, which is broader anteriorly and is called the medial malleolar facet. It articulates with the medial malleolus of the tibia and is continuous above with the superior articular surface for tibia. The long-axis medial malleolar facet is oriented anteroposteriorly. The inferior portion is nonarticular, and its anterior half is a depressed surface perforated by numerous vascular foramina. Under the tail of the medial malleolar facet, the posterior half of the inferior portion consists of a large oval area that provides insertion for the deep component of the deltoid ligament. The superior surface of the talar body is completely covered with articular cartilage for articulation with the tibia. It is shaped like a pulley, with the groove of the pulley termed the trochlea, closer to the medial border. The superior surface is broader in front than behind, convex anteroposterior axis, slightly concave from side to side: in front, it is continuous with the upper surface of the neck of the bone (see image below). 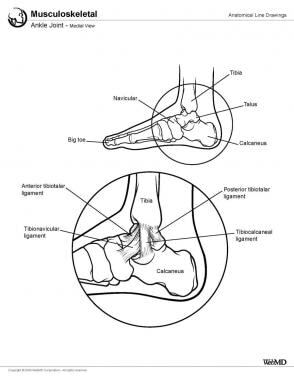 The inferior talar body surface presents 2 articular areas called the posterior calcaneal articular surface and the middle calcaneal articular surface . These articular surfaces, one for the posterior and the other for the middle calcaneal facets, are separated from each other by a deep groove, the sulcus tali. The groove runs obliquely forward and lateralward, becoming gradually broader and deeper in front. In the articulated hindfoot it lies above a similar groove upon the upper surface of the calcaneus, and forms, with it, a canal termed the sinus tarsi, in which lies the interosseous talocalcaneal ligament. The posterior calcaneal articular surface is large and of an oval or oblong form. It articulates with the corresponding facet on the upper surface of the calcaneus and is deeply concave in the direction of its long axis, which runs forward and lateralward at an angle of about 45° with the median plane of the body. The middle calcaneal articular surface is small, oval in form and slightly convex; it articulates with the upper surface of the sustentaculum tali of the calcaneus(see the first image below). The posterior surface is narrow, and traversed by a groove running obliquely downward and medialward and transmitting the tendon of the flexor hallucis longus (see the second image below). 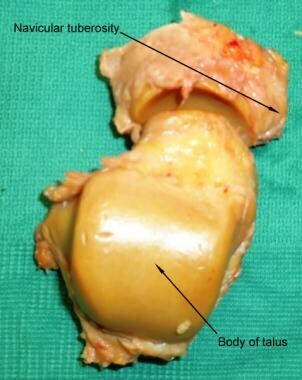 Posterior surface of the talus bone. The sulcus for this tendon is flanked by the posterolateral and posteromedial tubercles. 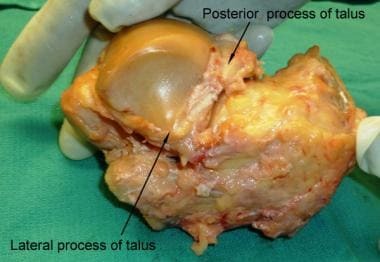 The posterior talofibular ligament is attached to the posterolateral tubercle, which is larger and more prominent than the posteromedial tubercle. The posterolateral tubercle contributes an inferior articular surface that is in continuity with the posterolateral aspect of the posterior calcaneal surface of the talus. An accessory bone, the os trigonum, may be found in connection with the posterolateral tubercle. The cuboid bone is placed on the lateral side of the foot, in front of the calcaneus, and behind the fourth and fifth metatarsal bones. It is cuboidal in shape but has a broader base oriented medially (see the image below). The dorsal cuboidal surface, directed upward and lateralward, is rough, for the attachment of ligaments. The plantar surface appears in front of a deep groove, the peroneal (fibularis) sulcus, which runs obliquely anteromedially. It lodges the tendon of the fibularis (peroneus) longus and is bounded behind by a prominent ridge, to which the long plantar ligament is attached. The ridge ends laterally in an eminence, the tuberosity, the surface of which presents an oval facet; on this facet glides the sesamoid bone or cartilage frequently found in the tendon of the fibularis (peroneus) longus. The surface of bone behind the groove is rough, for the attachment of the plantar calcaneocuboid ligament, a few fibers of the flexor hallucis brevis, and a fasciculus from the tendon of the tibialis posterior. The lateral cuboidal surface presents a deep notch formed by the commencement of the peroneal (fibularis) sulcus. The posterior surface is smooth, triangular, and concavoconvex, for articulation with the anterior surface of the calcaneus; its inferomedial angle projects backward as a process, which underlies and supports the anterior end of the calcaneus. The anterior cuboidal surface, of smaller size, but also irregularly triangular, is divided by a vertical ridge into 2 facets: the medial, quadrilateral in form, articulates with the fourth metatarsal; the lateral, larger and more triangular, articulates with the fifth metatarsal. The medial surface is broad, irregularly quadrilateral, and presents at its middle and upper part a smooth, oval facet, for articulation with the third cuneiform; and behind this (occasionally), a smaller facet, for articulation with the navicular; it is rough in the rest of its extent, for the attachment of strong interosseous ligaments. 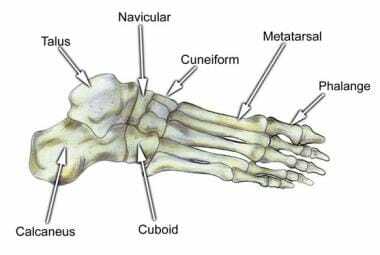 The cuboid articulates with 4 bones: (1) calcaneus, (2) third cuneiform, (3) fourth metatarsal, and (4) fifth metatarsal. It occasionally articulates with a fifth, the navicular. The navicular bone is located medially in the midfoot between the talus posteriorly and the 3 cuneiform bones anteriorly (see the following image). It forms the uppermost portion of the medial longitudinal arch of the foot and acts as a keystone of the arch. It is a boat-shaped bone that sits between the talar head and the 3 cuneiform bones. The navicular bone has 6 surfaces. Bones of the foot, larger lateral view. The posterior navicular surface is oval, concave, broader laterally than medially, and articulates with the rounded head of the talus (see the image below). Posterior surface of the navicular bone. The medial navicular surface slopes posteriorly to end in a rounded prominent tuberosity (see the image below), where a portion of the posterior tibial tendon is inserted. Much of the tuberosity accepts the attachment of the plantar calcaneonavicular (spring) ligament arising from the sustentaculum tali. Superior view of the talus and navicular bones. The anterior navicular surface is convex from side to side, and subdivided by 2 ridges into 3 facets, for articulation with the 3 cuneiform bones. The dorsal surface is convex from side to side, and rough for the attachment of ligaments (see the following image). The plantar surface is irregular, and also rough for the attachment of ligaments. The lateral surface is rough and irregular for the attachment of ligaments and occasionally presents a small facet for articulation with the cuboid bone. Dorsal surface of the navicular bone. The navicular articulates with 4 bones: the talus and the 3 cuneiforms. It occasionally articulates with a fifth, the cuboid. The 3 cuneiforms are named the medial, middle, and lateral, and they are convexly shaped on their broader dorsal surfaces. The middle and the lateral cuneiforms are also wedge shaped, so that the apex of each bone points plantarward and toward the center of the foot. The medial cuneiform is convex medially and rounded inferiorly. The medial and lateral cuneiforms project farther distally that the middle cuneiform to create a mortise for the base of the second metatarsal that articulates with the middle cuneiform. This configuration creates a keystone effect and contributes to the stability of the midfoot. See the following images. The medial cuneiform bone is the largest of the 3 cuneiforms. It is situated at the medial side of the foot, between the navicular behind and the base of the first metatarsal in front. The medial surface of the medial cuneiform is subcutaneous, broad, and quadrilateral. At its anterior inferior edge is a smooth oval impression, into which part of the tendon of the tibialis anterior is inserted; in the rest of its extent, it is rough for the attachment of ligaments. The lateral surface is concave, presenting, along its superior and posterior borders a narrow L-shaped surface, the vertical limb and posterior part of the horizontal limb which articulate with the second cuneiform, whereas the anterior part of the horizontal limb articulates with the second metatarsal bone. The rest of this surface is rough for the attachment of ligaments and part of the tendon of the fibularis (peroneus) longus. The anterior surface, kidney shaped and much larger than the posterior surface, articulates with the first metatarsal bone. The posterior surface is triangular, concave, and articulates with the most medial and largest of the 3 facets on the anterior surface of the navicular. The plantar surface is rough and forms the base of the wedge; at its back part is a tuberosity for the insertion of part of the tendon of the tibialis posterior. It also gives insertion in front to part of the tendon of the tibialis anterior. The dorsal surface is the narrow end of the wedge and is directed upward and lateralward; it is rough for the attachment of ligaments. The first cuneiform articulates with 4 bones: (1) navicular, (2) second cuneiform, (3) first metatarsal, and (4) second metatarsal. The second cuneiform bone, the smallest of the 3, is wedge shaped with a dorsal base and apex plantar. It is situated between the other 2 cuneiforms, and articulates with the navicular behind and the second metatarsal in front. The anterior surface of the middle cuneiform bone, triangular in form, and narrower than the posterior, articulates with the base of the second metatarsal bone. The posterior surface, also triangular, articulates with the intermediate facet on the anterior surface of the navicular. The medial surface carries an L-shaped articular facet, running along the superior and posterior borders, for articulation with the first cuneiform, and is rough in the rest of its extent for the attachment of ligaments. The lateral surface presents posteriorly a smooth facet for articulation with the third cuneiform bone. The dorsal surface forms the base of the wedge; it is quadrilateral and rough for the attachment of ligaments. The plantar surface, sharp and tuberculated, is also rough for the attachment of ligaments and for the insertion of a slip from the tendon of the tibialis posterior. The medial cuneiform articulates with 4 bones: (1) navicular, (2) first cuneiform, (3) third cuneiform, and (4) second metatarsal. The anterior surface of the lateral cuneiform is triangular and articulates with the third metatarsal bone. The posterior surface articulates with the lateral facet on the anterior surface of the navicular and is rough below for the attachment of ligamentous fibers. The medial surface of the lateral cuneiform presents an anterior and a posterior articular facet, separated by a rough depression: the anterior, sometimes divided, articulates with the lateral side of the base of the second metatarsal bone; the posterior skirts the posterior border and articulates with the second cuneiform; the rough depression gives attachment to an interosseous ligament. The lateral surface of the lateral cuneiform also presents 2 articular facets, separated by a rough nonarticular area; the anterior facet, situated at the superior angle of the bone, is small and semi-oval in shape, and articulates with the medial side of the base of the fourth metatarsal bone; the posterior and larger one is triangular or oval and articulates with the cuboid; the rough, nonarticular area serves for the attachment of an interosseous ligament. The 3 facets for articulation with the 3 metatarsal bones are continuous with one another; those facets for articulation with the second cuneiform and navicular are also continuous, but the facet for articulation with the cuboid is usually separate. The dorsal surface is oblong, its posterolateral angle being prolonged backward; whereas the plantar surface is a rounded margin and serves for the attachment of part of the tendon of the tibialis posterior, part of the flexor hallucis brevis, and ligaments. The third cuneiform articulates with 6 bones: (1) navicular, (2) second cuneiform, (3) cuboid, and (4-6) second, third, and fourth metatarsals. 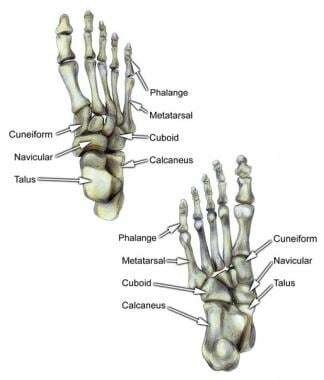 The metatarsal bones are numbered 1-5, from medial to lateral Each metatarsal has a head, neck, shaft, and base. The metatarsal bones are roughly cylindrical in form. The body tapers gradually from the proximal to distal end. They are curved in the long axis and present a concave plantar surface and a convex dorsal surface. See the following images. The head at the distal end presents a convex articular surface, oblong from above downward, and extending farther backward plantar than dorsal. Its sides are flattened, and on each is a depression, surmounted by a tubercle, for ligamentous attachment. Its plantar surface is grooved anteroposteriorly (for the passage of the flexor tendons) and marked on either side by an articular eminence continuous with the terminal articular surface. The first metatarsal bone is the stoutest and the shortest of the metatarsal bones. The body is strong and of well-marked prismoid form. The base usually has no articular facets on its sides, but occasionally on the lateral side an oval facet exists, by which it articulates with the second metatarsal. Its proximal articular surface is of large size and kidney shaped; its circumference is grooved (for the tarsometatarsal ligaments) and medially gives insertion to part of the tendon of the tibialis anterior; its plantar angle presents a rough, oval prominence for the insertion of the tendon of the fibularis (peroneus) longus. The head is large; on its plantar surface are 2 grooved facets, on which glide sesamoid bones; the facets are separated by a smooth elevation. The second metatarsal bone is the longest of the metatarsal bones, as it extends proximally the most, articulating with the recessed middle cuneiform. Its base is broad above, narrow and rough below. It presents 4 articular surfaces: one behind, of a triangular form, for articulation with the second cuneiform; one at the upper part of its medial surface, for articulation with the first cuneiform; and 2 on its lateral surface, an upper and lower, separated by a rough nonarticular interval. Each of these lateral articular surfaces is divided into 2 by a vertical ridge; the 2 anterior facets articulate with the third metatarsal; the 2 posterior (sometimes continuous) with the third cuneiform. A fifth facet is occasionally present for articulation with the first metatarsal; it is oval in shape and situated on the medial side of the body near the base. The third metatarsal bone articulates proximally, by means of a triangular smooth surface, with the third cuneiform; medially, by 2 facets, with the second metatarsal; and laterally, by a single facet, with the fourth metatarsal. This last facet is situated at the dorsal angle of the base. The fourth metatarsal bone is smaller than the preceding metatarsal bones; its base presents an oblique quadrilateral surface for articulation with the cuboid; a smooth facet on the medial side, divided by a ridge into an anterior portion for articulation with the third metatarsal, and a posterior portion for articulation with the third cuneiform. On the lateral side, a single facet, for articulation with the fifth metatarsal, can be found. The fifth metatarsal bone is recognized by a rough eminence, the tuberosity, on the lateral side of its base. The base articulates behind, by a triangular surface cut obliquely in a transverse direction, with the cuboid, and medially, with the fourth metatarsal. The tendon of the fibularis (peroneus) tertius inserts on the medial part of its dorsal surface. The fibularis (peroneus) brevis inserts on the dorsal surface of the tuberosity. A strong band of the plantar aponeurosis connects the projecting part of the tuberosity with the lateral process of the tuberosity of the calcaneus. The plantar surface of the base is grooved for the tendon of the abductor digiti (minimi) quinti and gives origin to the flexor digiti minimi (quinti) brevis. The base of each metatarsal bone articulates with one or more of the tarsal bones, and the head articulates with one of the first row of phalanges. The first metatarsal articulates with the first cuneiform, the second with all 3 cuneiforms, the third with the third cuneiform, the fourth with the third cuneiform and the cuboid, and the fifth with the cuboid. The phalanges of the foot correspond, in number and general arrangement, with those of the hand; 2 are found in the great toe, and 3 are found in each of the other toes. The phalanges of the foot differ from phalanges of the hand, however, in their size, with the bodies of the phalanges of the foot being much reduced in length, and, especially in the first row, laterally compressed. See the following images. The middle phalanges are smaller than the proximal ones but larger than the distal phalanges; the features at the base and head are similar to the proximal phalanges. The distal phalanges are flattened from above downward; each presents a broad base for articulation with the corresponding bone of the second row and an expanded distal tip for the support of the nail and end of the toe. The sesamoids give a mechanical advantage to the musculotendinous unit in which they are located and reduce friction and pressure in the nearby joint. The sesamoids may be totally or partially contained within the tendinous structure, and they may ossify or remain cartilaginous or partially ossify with a fibrocartilaginous interface between the ossified fragments. This variability in ossification might explain the radiographic absence or presence of various sesamoid bones, as well as the incidence of bipartism of sesamoids. The type 1 accessory navicular is small and round or oval and remains detached from the body of the navicular. This probably represents the sesamoid of the tibialis posterior tendon, and it is located on the plantar aspect of the tendon at the level of the inferior calcaneonavicular ligament. The type 2 accessory navicular is a definite part of the body of the navicular, but the tuberosity is separated by a fibrocartilaginous plate of irregular outline less than 2 mm in width. This type often becomes symptomatic and is occasionally mistaken for a fracture of the tuberosity of the navicular. Only type 2 accessory naviculars are characterized by a synchondrosis. Type 3 accessory naviculars are united by a bony ridge, producing a cornuate navicular. Type 2 and type 3 accessory naviculars constitute 70% of these deformities. Failure of primitive mesenchyme to segment leads to bones that are not separated, either partially or completely. The area where segmentation failed could be bony or cartilaginous, leading to different types of tarsal coalition and loss of motion between the unseparated bones. The most common coalitions are of the calcaneonavicular and the talocalcaneal middle facet. Rare coalitions include talonavicular, calcaneocuboid, naviculocuboid, and naviculocuneiform. Standring S, Gray H. Gray's Anatomy: The Anatomical Basis of Clinical Practice. 41st ed. New York, NY: Elsevier; 2015. Kelikian AS, Sarrafian SK. Osteology. Anatomy of the Foot and Ankle. 3rd ed. Philadelphia, Pa: Lippincott Williams and Wilkins; 2011. 40-120. Christman RA. Radiographic anatomy of the foot and ankle--part 3: the lesser tarsus. J Am Podiatr Med Assoc. 2014 Nov. 104 (6):633-43. [Medline]. Christman RA. Radiographic anatomy of the foot and ankle-part 2: the greater tarsus. J Am Podiatr Med Assoc. 2014 Sep-Oct. 104 (5):493-503. [Medline]. Christman RA. Radiographic anatomy of the foot and ankle—part 4: the metatarsals. J Am Podiatr Med Assoc. 2015 Jan-Feb. 105 (1):51-60. [Medline]. Christman RA. Radiographic anatomy of the foot and ankle-part 5. The phalanges. J Am Podiatr Med Assoc. 2015 Mar. 105 (2):141-9. [Medline]. Lepore L, Francobandiera C, Maffulli N. Fracture of the os tibiale externum in a decathlete. J Foot Surg. 1990 Jul-Aug. 29 (4):366-8. [Medline]. Ray S, Goldberg VM. Surgical treatment of the accessory navicular. Clin Orthop Relat Res. 1983 Jul-Aug. 177:61-6. [Medline]. Sella EJ, Lawson JP. Biomechanics of the accessory navicular synchondrosis. Foot Ankle. 1987 Dec. 8 (3):156-63. [Medline]. Inge GAL, Ferguson AB. Surgery of the sesamoid bones of the great toe. Arch Surg. 1933. 27:466-88. Harris RI, Beath T. Etiology of peroneal spastic flat foot. 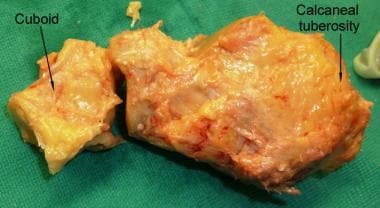 J Bone Joint Surg Br. 1948 Nov. 30B (4):624-34. [Medline]. Hobart MH. Fracture of sesamoid bones of the foot. J Bone Joint Surg. 1929. 11:298-302. Bones of the foot, lateral view, with distal portions of the tibia and fibula. 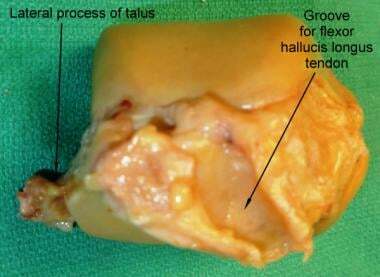 Inferior surface of the talus bone.